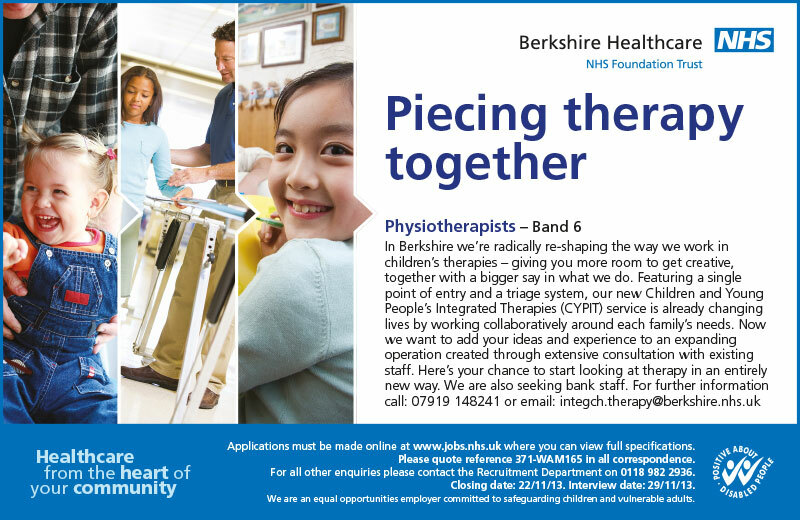 Therapy roles within the NHS are notoriously difficult to recruit to and Berkshire Healthcare NHS Trust was no exception to this issue. The Trust had recently been through a period of change to deliver an integrated Children’s therapy service through the Children and Young People’s Integrated Therapies Team (CYPIT). This team now incorporates Physiotherapy, Occupational Therapy and Speech and Language Therapy, thus creating a single point of entry and a holistic development team ensuring the best result for each child. Now the new structure was in place, Berkshire was ready to increase their team. WDAD worked closely with the Trust to communicate the right message to prospective Band 5 and 6 candidates in speech and language, physiotherapy and occupational therapy fields. By using individually targeted advertisements both on and off line, the key message was to tell candidates that, at Berkshire, they will have a voice and their creativity and ideas will be listened to – these are the resulting advertisements that went to press in November. The advertisements received a good response of excellent quality. Candidates applied from Scotland, Ireland and the north of England, far wider than anticipated and Berkshire Healthcare NHS Trust was able to recruit to all of the roles advertised. Not only was the advertising well received internally, it received positive feedback from candidates.